Coron, Palawan is one destination in the Philippines that we love taking our overseas guests to. On our recent visit, we decided to give THE FUNNY LION a try. We had heard really good reviews about this place from friends and on the internet. here are many hotels now being built in Coron. 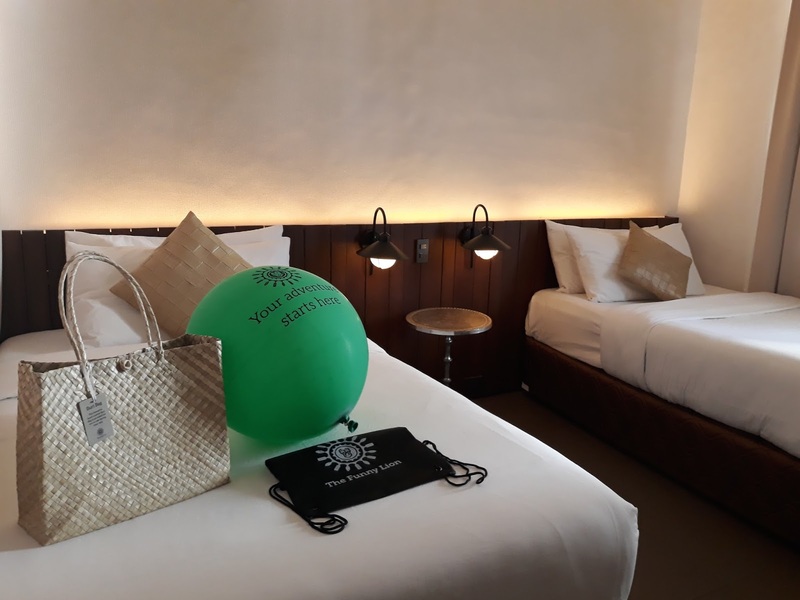 The Funny Lion is a beautiful and modern boutique hotel that is only 30 minutes away from the airport and a 15 minute tricycle ride into town. The hotel is situated in Poblacion, Coron which is a little elevated giving guests a picturesque view of Coron Bay. When we arrived at the hotel, we were given welcome drinks and a very cold towel to freshen up after a long trip from Manila to the hotel. Before we went to the room, we walked around and we were really amazed at the modernity of the place. The place feels very cozy and we loved the ambiance of the hotel. I also enjoyed how isolated you feel away from the bustling town of Coron. One of the many amenities in The Funny Lion that you could enjoy is their INFINITY POOL. The refreshing water that overlooks the lush hill forests really was a relaxing sight and many relaxing hours were spent in the pool. The room that we booked was a CUB ROOM which was spacious enough and had all the other amenities that you need in the room such as hot/cold shower, fridge, LED TV, coffee and tea, and of course, a safe box. The Funny Lion warmly welcomes you with fresh drinks in the fridge, a Buri bag that you can take with you during your island hopping tour, sling bags and a balloon that says ” Your Adventure Starts Here” which I found charming. The Buri bag provided by the hotel was really useful during our tour around town and during our island hopping. However, the bags will have to be surrendered upon checking out otherwise you can also pay Php 250.00 . It was worth getting one because these are tough bags. The room was very comfy and spacious, and the air conditioner worked really well. The toilet and bath was also very nice and I loved their home made shampoos and their refreshing shower gel. Drinking water is always available in the room and replenished everyday. The beds were nice and comfortable. The pillow was little bit high for me but adjusted well in the end. Over-all, sleep quality was really good. I love surprises and when at The Funny Lion, expect to be surprised. Each night, you will find little sweets next to your bed like this one. And on our last night, we received souvenir bracelets which were much appreciated. If there is one place I enjoyed the most during our stay at The Funny Lion, it was here on the 4th floor called the PRIDE ROCK DECK . This bar not only offers happy hour drinks, but also gives a magnificent view of Coron. A better way to enjoy your drinks and the panoramic view of Coron is by going for a dip in one of their 2 Jacuzzis that are located on either side of the Pride Rock Deck. The bar closes at around 10:00 pm giving guests time to soak and relax before bidding good night to a wonderful day. With so many things to love about The Funny Lion, food is something to look forward to. During our visit, they had a Christmas Dinner that was part of our package and what an awesome night that was. The variety of food was amazing but most of all, the food quality generally was superb. From fresh seafood, cold meats, cheeses, and other local and international favorites, you are definitely in for a nice treat. To conclude it all, our stay at The Funny Lion was a great choice to spend our holiday in Coron. This hotel really exceeded our expectations, location was perfect, and the hospitality of the staff were very commendable. It’s a place in Coron where total relaxation can be achieved and I look forward to my next visit.